LogiKal and SchüCal are special applications for facades, and KKP is specific to sunrooms. These programs support the construction and calculation process, and provide the perfect complement to your A+W Cantor software. The essential advantage of our new partnerships is saving you time while enabling you to maintain optimal control. Now, the master data for various profile systems in facade construction do not have to be entered into A+W Cantor. For example, once a design is created in LogiKal, all other processes, such as material ordering, production planning, etc. are handled by A+W Cantor. 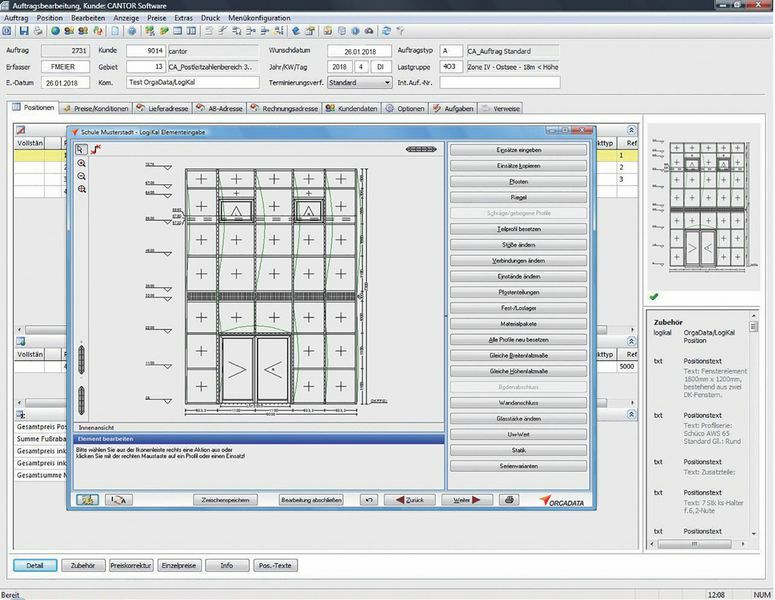 The person entering the order can take full advantage of the design functionality in the third-party system, yet maintain efficient control of all production processes in the A+W Cantor software. From A+W Cantor order item entry, the partner's software solution can be called up directly. When the design is complete, the bill of materials (BOM) is transmitted into A+W Cantor. Items in an order can be mixed, meaning they can include items designed using various systems. For example, enter an order for an aluminum door directly in A+W Cantor, then call up SchüCal to design the display window facade. Thanks to the integration, customers receive just one confirmation—generated by A+W Cantor—that lists all ordered elements. Only one order confirmation with all items, even if you use different construction systems in one order. Would you like to know more about simplified order entry by integrating partner software in the A+W Cantor ERP Software? Visit the A+W Cantor team at FENSTERBAU FRONTALE in Hall 1, Stand 329 - we look forward to seeing you!